After getting the 6th Mini Medal, you will have to talk to four specific NPC's to progress with the plot. You have to talk with the man who runs the Inn, the man inside the southwest house, the scholar inside the northeast house, and the blue NPC at the weapons shop (the one who looks like a warrior). Only then can you go inside the Church. When you do, talk to the pastor, go inside the bedroom, and talk to Evgenya so you can finally sleep inside the Church's bed. When you do, you will suddenly find yourself in the Dream World version of Amor, with the 7th Mini Medal and other entirely new items. If you are playing the SNES version (and do not sell the Bronze Shield to do the following), you will want to buy a Steel Broadsword for Carver. Then, if you can afford it, two Iron Shields for both Rex and Carver. It is not vital that you purchase the two now however; you can wait until after the next dungeon to do so if needed. And if you are playing the remakes, you should already have two Dragon Shields. Now would be a good time to update this guide's recommended stat seed distributions; after all, you now have three members in your party instead of just one. 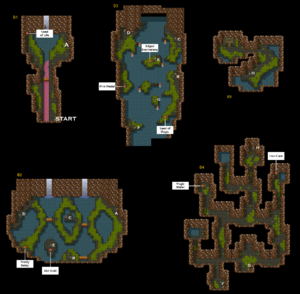 About the Seeds of Life: There is an extremely long, terrifyingly hard boss fight coming up at the end of Chapter 3; In fact, it is arguably the third hardest boss fight in the entire game, one that is infamous for being difficult. This is no hyperbole either; this boss is able to do up to 95 Damage in a single round with his magic, even with the Enchanted Armour on. This isn't so much a problem if you have 10x Yggdrasil Leaves lying around from the Casino; but if not, you're going to desperately need Milly's help if you ever want to beat him consistently. But she cannot pass that 95 HP threshold on her own without grinding; she's going to need two Seeds of Life in order to get there. About the Seeds of Magic and Pretty Betsy's: Same as before; Rex gets useful spells, and he doesn't have as much MP as others do. He also makes very good use of the Pretty Betsy's later on. About the Seeds of Strength, Resilience, and Wisdom: As said before, Carver is a pure melee attacker; what's more, he also has Forebearance. But Forebearance strats will not work to their full potential if he is put under a status ailment, or comes up short on durability. About the Seeds of Agility: Milly plays a crucial supporting role in the many boss fights coming up; it's helpful to guarantee that she will go before them. Of course, most of these are only recommendations; the only one that's true important is giving Milly some Seeds of Life if you're playing the SNES version. 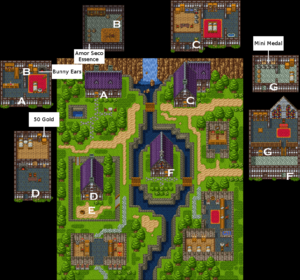 And speaking of recommendations for the SNES version, it is also highly recommended that you kill a Metal Slime while you are on the second floor; they give out 1350 EXP, and are much easier to kill with three party members than they are with two. When you do so, Milly will skyrocket all the way up to Level 8 and become much stronger than before. In fact, if you wish to be truely efficient about it, you would literally run around on Floor 2, running away from every single encounter until you finally find (and kill) a Metal Slime. It sounds unorthodox, but it's faster to do that than it is to simply fight every enemy until you gain 1350 EXP. This is not mandatory however, not even in the SNES version. Skipping this opportunity just means that you may have to fight more enemies before being able to take on that one Chapter 3 boss. You will note several new aspects to this game's enemy A.I. First of all, this is the very first boss in the game to operate on a semi-fixed pattern instead of the random ones we saw before. The Grrrgoyle will always use either Slash or Fuddle Dance for it's first move. It will always use Dazzleflash or Fuddle Dance for it's second move, and then it will always use a Slash or regular Attack for it's third move. Then it will go back to the start of it's three step pattern until the end of the fight. Secondly, this enemy has two special kinds of targeting. While some enemies have an equal chance of attacking any PC in your party, 50% or more of them (including most bosses) will attack your party based on who is in what slot in your party. This is why Carver is in the 1st slot of all of the Equipment recommendation tables listed in this guide so far. It arrives at the start of it's semi-fixed Attack Pattern (if it has one). Assuming that the second option is what occurs, the Grrrgoyle will then choose to attack whoever has the lowest percentage of their Max HP. So if Carver ends up at 80 HP, and Rex ends up at 20 HP, the Grrrgoyle will turn it's focus to Rex instead. Of course, none of this matters too much as far as this fight goes, for the Grrrgoyle is relatively easy. It has no resistance to Sap, and Milly's Buff spell will utterly negate it's physical attacks if she casts them enough times on someone. 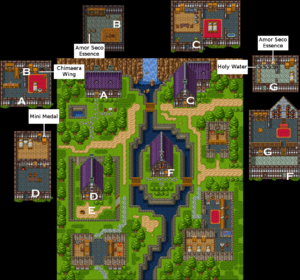 This guide only mentions all of this for later on, when the bosses are not so simple. Talk to Ilya and raid any chests that you skipped on the way to the boss. After that, go back to Amor, rest up at the Church, and you will find yourself back in the Real World. By the end of it all, you should have both the Agility Ring (30+ Agility) and the Moonmirror Key in your possession. 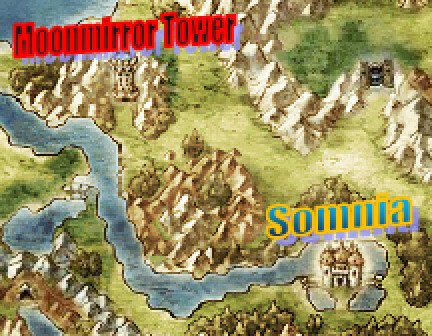 So return to Somnia, and head on out to Moonmirror Tower! This page was last edited on 27 April 2017, at 07:36.